Cycling cadence refers to the rate at which the pedals turn when you're riding your bike. Watts refer to a specific unit of power that you can increase or decrease when riding your bike. 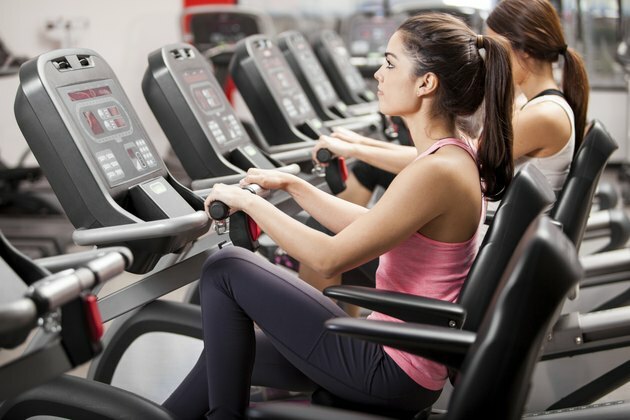 Although many indoor stationary bikes will monitor both your watts and cadence, each one reveals a unique aspect of your cycling and overall body strength. Cadence can be defined as the specific rate with which you turn the pedals on your bike. Focusing on increasing your overall cadence will improve your speed on your bike as well as reduce your race time. Indoor cycling is usually on a level track; and stationary bikes can simulate up and downhill riding. As a result, your cadence will naturally slow down to between 50 and 65 rpms. For distance racing, keeping a steady cadence will improve your pacing, allowing you to maintain consistent speeds throughout your exercise. Watts are a unit of measurement used in cycling to measure your power output when riding your bike. Increasing the amount of watts that you produce during a riding session will increase not only your speed, but your acceleration and force. Although your cadence will tie directly into the amount of watts that you output, they're not one in the same. Your cadence varies throughout the ride, so the amount of watts produced is an overall number that focuses on the duration and intensity of your cycle. This benefits you as a rider if you're looking to boost stamina and endurance over the course of a long race. Indoor cycling is a specific type of indoor cycling which is performed on a stationary bike. The bike has a weighted flywheel and handlebars for you to hold when riding. With respect to cadence and watts, both are essential when engaging in indoor cycling. Counting watts may be more crucial for indoor cyclists looking to boost endurance and strength; and improving your cadence will help improve your speed and acceleration on your indoor bike. Indoor cycling is an intense cardiovascular workout that can help improve your endurance and stamina, but you should use caution while engaging in this exercise. Consult a doctor to make sure that you're healthy enough to cycle indoors for extended periods of time. In addition, staying properly hydrated while riding is essential to prevent you from fainting or suffering from dehydration. Cycle in a room that's properly ventilated and sufficiently cool. Cycle Ops: Watt's Up In indoor Cycling?